Performers include: Bill Cosby, Phylicia Rashad, Malcolm-Jamal Warner, Keshia Knight Pulliam, Tempestt Bledsoe, Lisa Bonet, Raven-Symone, Sabrina Le Beauf, Geoffrey Owens, Earle Hyman, and Deon Richmond. The most popular sitcom of the 1980s which helped to reinvigorate the genre. 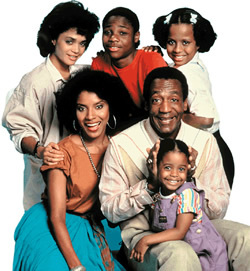 The series follows the Huxtable family, an upper-middle class family from Brooklyn, New York. Playful obstetrician Heathcliff “Cliff” Huxtable (Bill Cosby) and his eloquent and elegant attorney wife Clair (Phylicia Rashad) run their household and raise their five children with humor, patience and love. The Huxtable kids are sensible Sondra (Sabrina Le Beauf), rebellious Denise (Lisa Bonet), uninspired Theodore “Theo” (Malcolm-Jamal Warner), overly dramatic Vanessa (Tempestt Bledsoe), and adorable Rudith “Rudy (Keshia Knight Pulliam). As time goes on, the family expands to include Elvin Tibideaux (Geoffrey Owens), Pam Tucker (Erika Alexander), and Martin and Olivia Kendall (Joseph C. Phillips and Raven Symone). The show was NEVER cancelled. Bill Cosby intentionally decided to have the series go out STILL on top. So to classify it as cancelled when it is historically know as one of the few shows to leave air without being cancelled, is rediculous. A great show indeed. This is a wonderful teaching show. Now most of he shows are stupid and don’t show a lesson. The Cosby show is funny and wonderful to learn from. The Cosby Show is my favorite television show ever. It shows love, patience and values throughout the Huxtable home. I have every season on dvd and I must say, you haven’t had a childhood if you never watched The Cosby Show, just my opinion. I watched the Cosby Show when I was a kid. It is good television film series. The Cosby family can become an example of an ideal family in USA.